The Alcon Pad is based on the Ferodo DSP compound. They are the OEM pad provided in all Paragon, and certain alcon brake kits. They are fantastic street use with good cold-temperature characteristics, rotor life, and dust control. 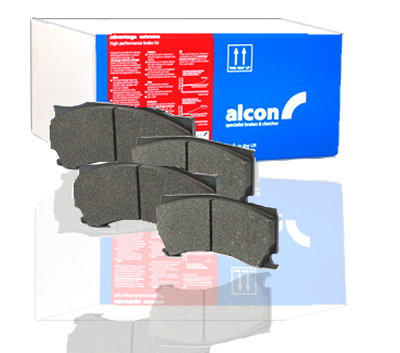 The Alcon Pad is the international favorite and is the preferred compound for Alcon tuners. Delivering brake performance usually associated with the racetrack, these brake pads bring tuners all the benefit of our racing know-how and experience for daily use on the road. The specialized compound gives both low and high speed braking efficiency, reduced stopping distances and great control. You can be confident that our high performance brake pads undergo rigorous testing and development, from laboratory and dynamometer testing cycles to race circuit and road trials. With a thermal under-layer between the friction material and the backing plate, to help dissipate heat during high speed braking, these are High Performance tuning pads for the road. . This prevents problems often associated with extreme conditions, such as overheating, damaged calliper seals and brake fade. They also have excellent water recovery characteristics that allow you to regain optimum efficiency quickly - without losing control. Built-in anti-corrosive properties ensure there is no danger of brake seizure.